As advertised on the sleeve of this single, 'Belle' is an extract from the musical Abbacadabra, as performed in France. The song adds French lyrics, written by Alain and Daniel Boublil, to the instrumental track 'Arrival', which originally appeared on Abba's 1977 album 'Arrival'. 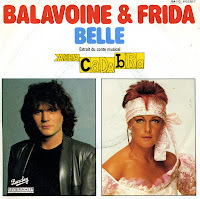 Daniel Balavoine (February 5, 1952 - January 14, 1986) recorded the track together with Frida from Abba, making this a nice collectors item for Abba fans. I bought it out of curiousity more than anything - and once again, I was rewarded.